Veto Goes Mad. General Garfield and Veto at Lawnfield, Mentor, Ohio. It was on 19 September 1881 that President James A. Garfield, shot by Charles Guiteau on 2 July, died of gangrene from the probing, septic fingers of the physicians. The entire country mourned, including the President’s favorite black Newfoundland dog, Veto, left behind on the family farm in Mentor, Ohio. In the summer of 1880, when the first delegation of enthusiastic politicians came trooping up from the Mentor station through the lane that led to “Lawnfield,” in order to congratulate General James A. Garfield on his nomination for the Presidency, there was one member of the Garfield household who met the well-meaning but noisy strangers with an air of astonishment and disapproval, and, as they neared the house, disputed further approach with menacing voice. This was “Veto,” General Garfield’s big Newfoundland dog; and not until his master had called to him that it was “all right,” and that he must be quiet, did he cease hostile demonstrations. After that, whenever delegations came — and they were of daily occurrence — Veto walked around among the visitors, looking grave and sometimes uneasy, but usually peaceful. General Garfield was very fond of large, noble-looking dogs. Veto was a puppy when given to him, but in two years’ time had grown to be an immense fellow, and devotedly attached to his master. He was named in honor of President Hayes’s veto of a certain bill in the spring of 1879. The bill was one for abolishing the office of marshal at elections. It did not meet with the President’s approval, and he returned it to Congress unsigned,— an action which greatly pleased General Garfield, and suggested the name for his dog. Although quiet, as he had been bidden, Veto was never reconciled to the public’s invasion of the Mentor farm. He was a dog of great dignity, and could not but feel resentment at the familiarity of the strangers who, on the strength of their political prominence, overran his master’s fields, spoiled the fruit-trees, peered into the barns and poultry yard, and were altogether over-curious and intrusive. He had been told that it was “all right”; but these actions by day, and the torchlights and hurrahing by night, wore on his spirits and temper. This evident unfitness for public life caused a final separation from his beloved master; for when, in the following spring, the family moved to Washington to begin residence at the White House, they thought it was not best to take Veto with them, so he was left behind in Mentor. Poor fellow! all his doubts and fears for the safety and peace of him he loved and guarded were indeed well-founded. That first invasion of Lawnfield was but the beginning of what was to end in great calamity and bitter sorrow. Veto never saw his master again. After the death of General Garfield, Veto was taken to Cleveland, O., where he spent his remaining days in the family of J. H. Hardy — a gentleman well known in that city. Several anecdotes are related by Mr. Hardy which prove the dog’s great intelligence. He slept in the barn, and seemed to consider himself responsible for the proper behavior of the horses, and the safety of everything about the barn. No one not belonging to the family was allowed even to touch any article in it. Veto’s low thunder of remonstrance or dissent quickly brought the curious or meddlesome to terms. One night he barked loudly and incessantly. Then, as this alarm signal passed unnoticed, he howled until Mr. Hardy was forced to dress and go to the barn, where he found a valuable horse loose and on a rampage. Veto had succeeded in seizing the halter, and there he stood with the end in his mouth, while the horse, disappointed of his frolic and his expectation of unlimited oats, was vainly jerking and plunging to get away. Another time, upon returning late at night from a county fair, the family heard Veto—who was shut up in the barn — howling and scratching frantically at the door. When it was opened, he rushed directly to another barn some rods away, belonging to and very near a house occupied by a large family, who all were in bed and asleep. He scratched at the door of this barn, keeping up at the same time his dismal howl, and paying no attention to the repeated calls and commands to “come back and behave ” himself. Just as force was to be used to quiet him, a bright tongue of flame shot up through the roof of the barn, and, almost in an instant, the whole structure was in a blaze. Before the fire department reached the spot the barn was consumed, and the house was saved from destruction only through heroic efforts of the neighbors. And so Veto’s quick scent and wonderful sagacity in, as we must believe, giving the alarm, not only saved the house, but probably averted serious loss of life. Although I don’t know if the account is accurate, it was reported in the Chicago Tribune that Garfield had done a favor for an African-American servant of General Winfield Scott, who bred horses and dogs. 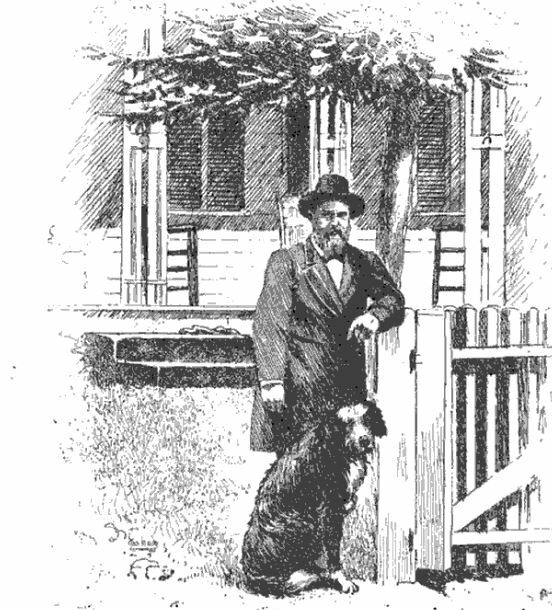 After Scott’s death, the servant continued breeding dogs and in thanks presented a Newfoundland puppy to Garfield. Veto was Garfield’s constant companion on his tours of inspection around the farm and he was indulgent to the big dog. Newfoundlands are sociable dogs and Veto did not take kindly to a slight. Veto was a favorite with the Garfield children and he was happy on the farm at Mentor. Why was he sent away? I found this odd, minor, Fortean anecdote which suggests one explanation for his exile. I have not seen this story anywhere else in the presidential pet literature, or, indeed, anywhere except this one newspaper. If the sagacious canine stories told of his time with the Hardy family are true, he could not have had rabies. Of course, Newfoundlands are subject to heat stroke, so perhaps the “sultry Sunday,” was the culprit, rather than some psychic link between his lost master and himself. Any other reports of Veto’s madness when Garfield died? Or, since it is told after the fact, is this just barking? Previously I wrote about a child’s vision of Garfield among the angels and of the gruesome post-mortem career of Charles Guiteau’s face.